The Hybrid Pro Modular Kit 16 is a stylish modular exhibit with depth and dimension making it a great way to establish yourself as a veteran at any venue. The modular display frame is heavy-duty and durable. With available features like push-fit graphics, shelving, tables, monitor mounts, storage areas, and much more. The Hybrid Pro Modular series is a cut above the rest when it comes to quality. Make yourself stand out at your next event with the Hybrid Pro series backwall. 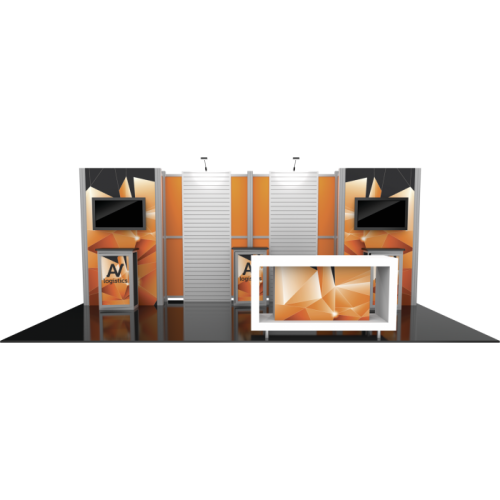 Tradeshow Hybrid Pro 20ft Modular Backwall Kit 15Hybrid Pro Modular Kit 15 is a stylish modular exhi.. Custom Hybrid Pro 20x20 Modular Island Kit 18Hybrid Pro Modular Kit 18 is a stylish modular exhibit ..